We weave through the rich history of this Japanese bamboo basket. Traditional utensils go a long way towards enhancing your enjoyment of varied cuisines, and Japanese fare is no exception. 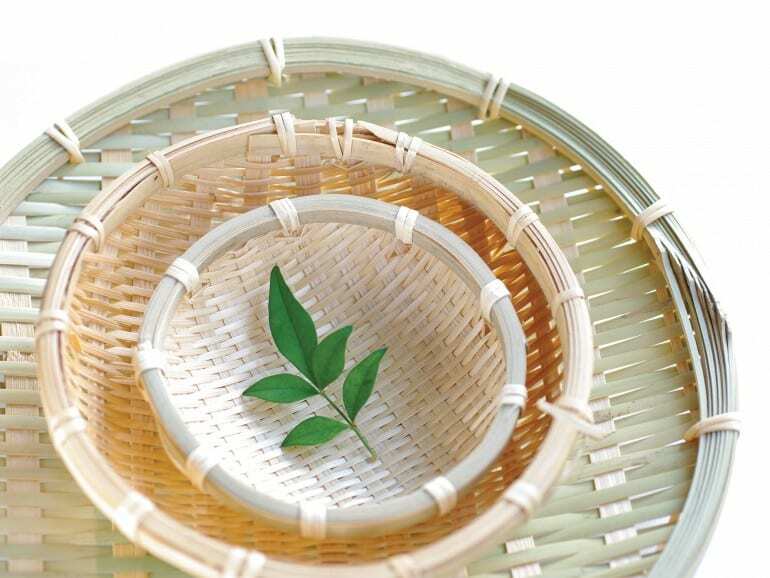 The zaru is one such tool – a woven bamboo basket used in the preparation and presentation of Japanese cuisine. This shallow tray is a familiar sight in kitchens across Japan, and most commonly functions as a colander or strainer that is used in cooking and rinsing, the harvesting of crops or as a dish to serve individual portions of noodles. Basket crafting in Japan serves a utilitarian function, with the products made being used well and often. The creation of this tool dates back to the Edo period, or the gage of craftsmen,h during which craftspeople (termed shokunin) worked with indigenous materials such as wood, clay and bamboo to create small hand-held wares. Today, there remain areas in Japan that steadfastly hold on to traditional ways of crafting bamboo. For instance, the famous Shino-bamboo craft from the historical town of Iwadeyama first developed during the Edo period, and later grew to be a side job of local farmers in the agricultural off-season more than 300 years ago. The tradition lives on till today, as tourists from all over the world can buy Shino-bamboo crafts from Iwadeyama and learn Zaru knitting. Bamboo kitchen baskets come in a variety of shapes, sizes and weave patterns, based on the function the basket serves. The traditional zaru is typically weaved with horizontal bamboo strips (higo) being woven around vertical bamboo strips, with the outside of the bamboo becoming the inside of the basket, and creating a smooth surface ideal for washing food. One of the more common uses of zaru you may encounter today is in zaru-soba, a cold noodle dish. Soba noodles made from buckwheat and wheat flour are cut thinly, boiled and eaten with a cold dip made from soy sauce and dashi stock. These flavorful ash brown noodles are topped with shreds of dried laver (nori) and served on a square or round zaru colander, giving the dish its name. Interestingly, the zarufs use is not limited to just practical purposes. The annual summer Zaruyaburi festival in the Mie prefecture brings together 70 to 80 young men, competing in traditional loincloths, for possession of a zaru basket. Held at the Ishiki and Yakumo shrines, this traditional ceremony dates back some 450 years, and legend has it that the man who wins control of this bamboo prize would be blessed with good luck and health during the year. Additionally, in fact, the zarufs ability to strain and sieve liquids has been referenced in Japanese colloquial slang to describe a person who can consume large amounts of alcohol without being inebriated. The word is also used to describe a person who is careless and makes easy mistakes, with these mistakes being likened to water easily slipping through the holes in a zaru. Suffice to say, the significance of zaru in Japanese culture and cuisine would not be slipping through the cracks anytime soon.